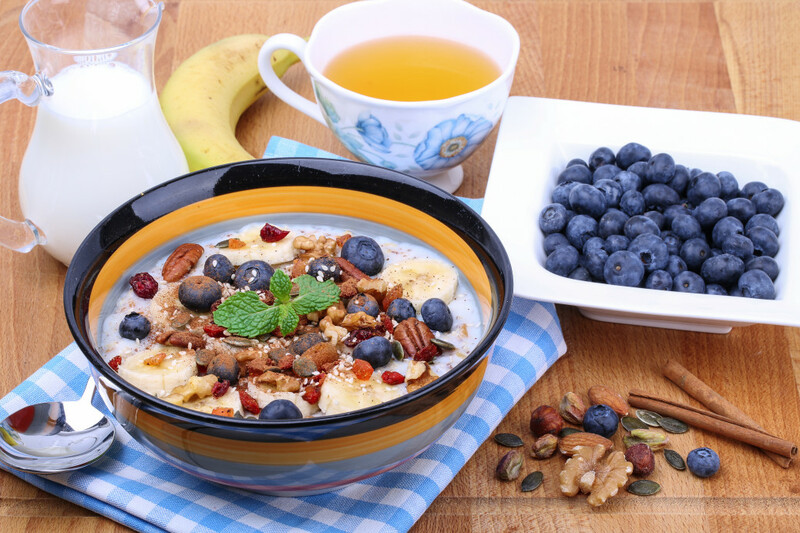 Tip: Encourage your children to add chopped fresh berries and nuts (if not allergic) to their porridge too for helping to increase their vitamin and nutrient content. Place the porridge oats in a medium pan with milk and water and place over a medium heat. Add the fresh or frozen blueberries, saving a few for the top. Mix lightly. If you are using frozen berries these will defrost in the hot porridge. Spoon the porridge onto a bowl, top with the remaining blueberries, spinkle over the walnuts and dates and drizzle over the honey. Walnuts contain zinc and omega 3 fat for healthy skin. Almond milk provides vitamin E for moisturising the skin, calcium and vitamin D for healthy bones. It's free of antibiotics and hormones found in conventional dairy. Rich in antioxidants, such that they have the highest antioxidant content of any fruit. Good source of dietary fibre for good digestion. High content of vitamin C for collagen and elastin production, components of the skin that keep it toned and firm.